A roof is essentially the hat of a building, providing protection against exposure to nature’s elements. At the same time, it also adds a finishing touch to a building and contributes greatly to the overall aesthetic. The rigid material that is steel offers strength and longevity, and roof applications are gaining popularity across the country, from industrial and commercial to residential buildings. “At first glance, roofing paint systems may appear similar, but each has qualities and properties that set it apart,” notes Melvin Hickers, Product manager for galvanised and colour-coated products at ArcelorMittal South Africa. “For example, a Chromadek® roof is designed with a paint system that is unique and specifically developed for African climatic conditions. This makes it an ideal choice when it comes to sustainable roofing,” he states. • Improved gloss and colour retention, which ensures longevity. • A heat-reflective colour range that is energy efficient, including the colours Aloe Green, Buffalo Brown, Dark Dolphin and Charcoal Grey. • A chrome-free, locally-produced, hot-dipped organic coated roofing material. Did you know? 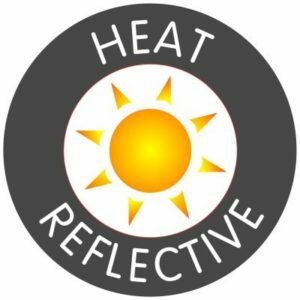 You don’t need to request heat reflective technology in your specification or pay extra for it. If you specify one of the four heat reflective Chromadek® colours by name and brand, the technology will automatically form part of the product – and at no additional cost. Chromadek® was originally designed in 1976 to meet requirements in terms of both form and function, and has been refined, enhanced and tested through a 41-year long standing association with the built environment. “Its unique features render Chromadek® the primary choice for roofing, as showcased in the impressive Kasane Airport project in Botswana,” Hickers says. This particular roof of the new terminal building was profiled with 0,58mm Dove Grey Chromadek® colour-coated galvanised coil and won an award in the metal cladding category of the SAISC Steel Awards for 2017. What differentiates Chromadek® as a sustainable colour-coated roofing solution, is the elimination of the chrome content in the pre-treatment, primer, and the top and backing coats applied. In turn, the need to treat chrome-containing effluent, produced as a by-product when producing colour-coated steel, is eliminated. This lends itself to sustainable manufacturing through the controlled emission of chrome when producing the preferred colour-coated roofing solution. “In doing so, every coil of Chromadek® for roofing and cladding produced by ArcelorMittal South Africa is committed to making a sustainable difference,” states Hickers. In addition, the consideration that every building is a combination of materials that can contribute to thermal efficiency is a promising avenue in innovative construction. “With the advent of developments in innovative materials, consider for a moment what makes a Chromadek® roof cooler as it becomes hotter, when exposed to the sun,” says Hickers. 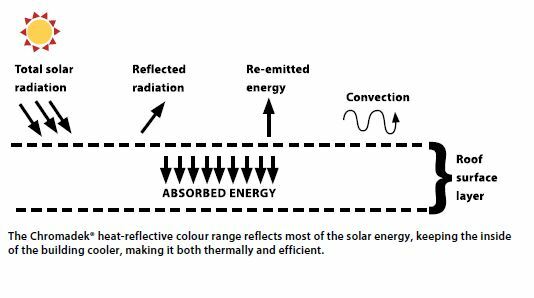 “The logic involved with heat reflectivity as an aspect of thermal efficiency starts with the explanation that dark colours absorb most of the visible light striking a surface, while lighter colours reflect most of that solar energy. This would suggest that colour is an indication of how much visible solar energy will be reflected. The amount of infrared energy that is reflected is often a function of the colour as well,” Hickers explains. “Chromadek® is a preferred steel colour-coated roofing choice, ideally suited to Africa’s climatic conditions. When looking for a ‘going-green’ colour-coated steel roofing solution, it makes sense to consider Chromadek® or Chromadek Ultim®, the only local organic-coated materials supplied as chrome-free,” Hickers concludes. For more information about Chromadek®, visit the website www.chromadek.com. Caption main image:For the meandering roof of the new terminal building at Kasane Airport in Botswana, ArcelorMittal supplied the Zip-Tek 420 profile with 0,58mm Dove Grey Chromadek® colour-coated galvanised coil. The project was named the winner in the metal cladding category of the SAISC Steel Awards for 2017.